As predicted a year ago, the adoption of US-style covenant-lite terms in European leveraged deals continues apace. This is hardly surprising given that the existence of ultra-low interest rates are sparking intense competition for yield amongst financial investors. Sponsors and advisers are increasingly applying approaches from the US leveraged loan and global high yield bond markets to European leveraged loans. Sponsor friendly terms are very much in fashion. 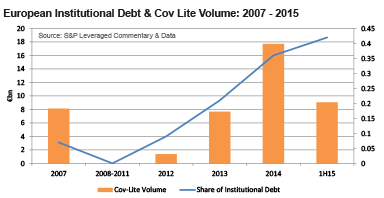 Covenant-lite loan financings are far from uniform in Europe at this stage, yet they continue to evolve gradually. In 2013, we saw some fully US-style covenant financings for the acquisition of European assets documented under New York law and either partly or wholly syndicated in Europe. Next came Loan Market Association (LMA) based English law credit agreements that were stripped of most of the financial covenants. These covenant-lite loans have no financial maintenance covenant, or a single covenant that protects just the revolving credit facility (such covenants are often “sprung,” so tested only when a certain percentage, often 30%, of the revolving credit facility is drawn). In 2015, we have seen even greater US-style flexibility in English law credit agreements, including in negative covenants, particularly in permitted debt baskets, with leverage and secured leverage ratios being introduced with flexibility extending to the incurrence of senior and junior debt, both within and outside the existing credit documentation. “Restricted payment builder baskets”, a feature from the high yield debt securities market, are also being used to calculate dividend capacity, moving away from the traditional tests based on excess cash flow and subject to a leverage limitation. Other baskets have “soft caps”, linked to EBITDA or total assets, rather than traditional fixed baskets. This debt flexibility raises structuring challenges which affect both sponsors and lenders. European leveraged loan documentation has developed complex intercreditor agreements over many years to provide a consistent and stable contractual framework for financial restructurings, in the absence of consistent legislation across Europe. If significant new debt can be raised outside existing credit documentation, a greater element of control and documentary regulation may be needed than in the United States, where Chapter 11 governs issues such as priority and releases of claims and security. This significant new debt may face limitations, for example it may not be “structurally senior” or may be subject to requirements to become subject to existing intercreditor arrangements. For sponsors assessing the leveraged loan market, taking a lead from the US, which has consistently led the global leveraged loan market in flexibility, does make sense. As European structuring issues remain as critical as ever, financing parties and investors need to remain closely familiar with loan terms, both in the US and Europe, to ensure a consistent level of negotiation. Investor demand remains high, and sponsorfriendly terms will increase, but at some point a downturn in investor demand or credit quality will place these issues under increased focus.